Margaret M. (nee Buehler) DiIenno, of Maris Grove formerly of Yeadon, passed away on March 24, 2019 at the age of 91. Loving mother of Dale (Scott) Wintemberg, Jack (Dot), Deb (Bob) Stango, Mike (Maryann) and the late Bill DiIenno. Also survived by 14 grandchildren, 17 great grandchildren, and one great-great grandchild. 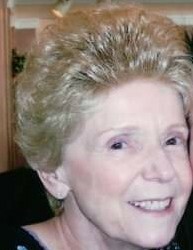 Relatives and friends are invited to attend her Funeral Mass 2:00 P.M. Friday at St. Pius X Church, 220 S. Lawrence Rd, Broomall, PA where friends may call from 1:00 P.M. at the Church. Interment Ss. Peter & Paul Cemetery. Friends may also call Thursday evening from 6-8:00 P.M. at the Logan Funeral Home, 57 S. Eagle Rd, Havertown, PA 19083. In lieu of flowers family prefers contributions be made in memory of Peggy DiIenno to Maris Grove Resident Care Fund, 200 Maris Grove Way, Glen Mills, PA 19342.